The advent of more conservative methods in renal surgery has necessitated a more precise knowledge of renal vasculature. Anson and Kurth in 1955 have quoted “experience shows that super-numerary arteries and veins represent the rule in renal vasculature, not the exception.” Being “end arteries,” ligation or accidental injury to renal artery may lead to renal infarcts. This observation is important during renal transplants for a complete and accurate anastomosis with all the arteries of the donor kidney. Kem2 et al in 2005 have reported two relatively young patients with significant hypertension, both having an accessory renal artery. The presence of variant renal arteries may also be associated with other underlying renal pathological conditions such as hydronephrosis. The study was based on dissection of 1060 adult cadaveric kidneys (620 male and 440 female) from Western India. Ethical Committee approval was obtained. Comprehensive dissection was carried out, and observations on the origin and course of the renal artery were made. The presence of accessory renal arteries and their relation to the main renal artery was noted. The specimens were colored by standard color code after applying gelatin suspension, and color photographs were obtained. The number of renal arteries observed on the right and left side in males and females is shown in [Table 1]. When males and females were considered together, single renal artery was seen in 77.35% on the left side and in 72.64% of specimens on the right side. Similarly, two renal arteries were present in 18.86% of specimens on the left side [Figure 1] and in 22.64% of specimens on the right side [Figure 2]. Furthermore, three renal arteries were present in 3.77% of specimens on the left side, whereas the incidence on the right side was 4.71% [Figure 3]. Table 1: Incidence of renal arteries in the present study. Figure 1: Specimen showing left accessory artery. Figure 2: Specimen showing a right accessory artery. Figure 3: Photograph showing three renal arteries on the right side. The observed values were analyzed statistically. Chi-square value for the right side was 13.44, and P value was 0.0012 (P <0.05), whereas Chi-square value for the left side was 15.02, and P value was 0.0005 (P <0.05). Hence, statistically, it proved that the accessory renal arteries, number wise, are significantly more common in both right as well as the left side. The comparison of total accessory renal arteries observed in males and females in the present study is shown in [Figure 4]. Figure 4: Incidence of accessory renal arteries in the present study. The relationship of the accessory renal arteries to the main renal artery was noted and is shown in [Table 2]. 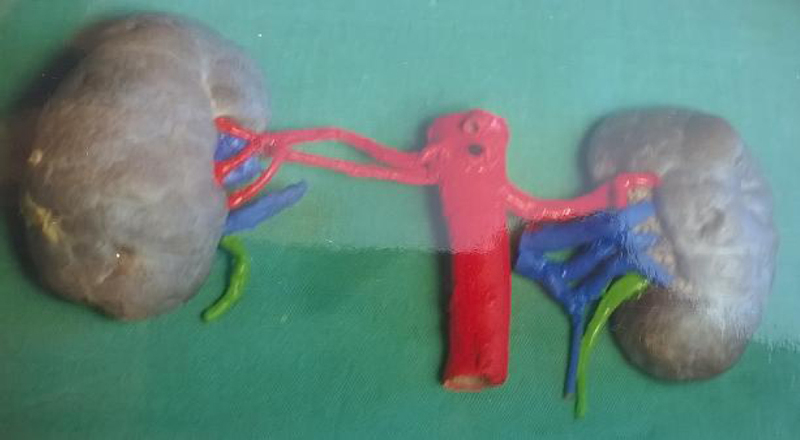 Most of the accessory renal arteries were placed superiorly [Figure 5]. Some of the specimens showed both superior and inferior accessory renal arteries. Table 2: Relation of accessory renal arteries to main renal artery. Figure 5: Photograph showing a superior accessory artery. The incidence of a number of renal arteries was compared with previous studies [Table 3]. Table 3: Variations in renal arteries in various studies (Figures in %). According to Standring and Moore and Persaud, kidney receives a single renal artery in about 70% and 75% of cases, respectively. In the present study, single renal artery was observed in 74.99% of cases [Table 1]. The incidence of accessory renal artery according to Standring is about 30%. In the present study, the incidence of accessory renal artery was 24.99% [Table 1]. Decker and Du Plessis have quoted that there is an accessory renal artery in 15% and 20% of cases on the right and left side, respectively. When all accessory renal arteries were taken into consideration in the present study, higher figures were noted on the right side (27.35%) than on the left side (22.63%) [Table 1]. Unilateral double renal vessels were reported by Mohammed in 2012. Bilateral duplication of renal vessels was reported by Bordei et al in 2004 and by Mir et al in 2008. The same was also observed in the present study [Figure 6]. Bilateral triple renal arteries were observed by Pestemalci et al in 2009. Anson et al and Reis and Esenther have noted four arteries on the right as well as the left side. A maximum number of arteries were observed by Carson. He has reported five arteries on the left side. In the present study, maximum of three renal arteries was found [Figure 3]. 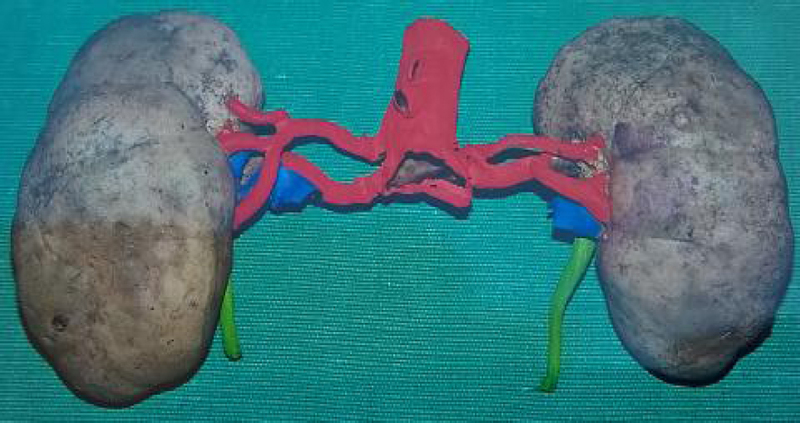 Figure 6: Photograph showing bilateral doubled renal arteries. The anatomic relation of these accessory renal arteries to the main renal artery was looked for. Sykes has noted that inferior accessory renal arteries are more common. However, Olsson has stated that superior accessory renal arteries are common. The present study showed a higher percentage of superior accessory renal arteries [Table 2]. The diversity of vascular pattern can be explained on the basis of its development. The kidney that initially develops in the sacral region gradually ascends up. As it starts ascending, newer renal arteries start developing from the aorta. With the appearance of newer arteries, the caudal branches normally involute and disappear. A less complete reduction results in extra-renal branching or in multiple arteries arising independently from the aorta. Due to this unique character of the kidney, this unusual pattern of vascular distribution is observed. The study conclusively proved the complex nature of renal vascular distribution in the population of Western India. This emphasizes the necessity of the knowledge of renal vasculature to a surgeon operating on the kidney. With the advent of laparoscopic renal surgeries and donor nephrectomies, it becomes mandatory for the surgeon to understand the abnormality or variations in the renal vasculature. If this is not identified, it may jeopardize the renal transplantation. The detailed information of the vasculature will reduce the chance of hemorrhage due to accidental trauma to accessory renal artery. This can avoid unwanted postoperative morbidity and mortality. Anson BJ, Kurth LE. Common variations in the renal blood supply. Surg Gynecol Obstet 1955;100:157-62. Kem DC, Lyons DF, Wenzl J, Halverstadt D, Yu X. Renin-dependent hypertension caused by nonfocal stenotic aberrant renal arteries: Proof of a new syndrome. Hypertension 2005; 46:380-5. Standring S. Gray’s Anatomy. The Anatomical Basis of Clinical Practice. 40th ed. Edinburg: Churchill & Livingstone; 2008. p. 1231, 1233. Moore KL, Persaud TV. The Developing Human – Clinically Oriented Embryology. 6th ed. Philadelphia: W.B. Saunders Co.; 1999. p. 311. Decker GA, Du Plessis DJ. Lee Mc’Gregor’s synopsis of surgical anatomy. Indian Edition. 12th ed. Bombay: K.M. Varghese Co.; 1986. p. 289-300. Mohammed AM, Abdalrasol RG, Abdalhai KA, Hamad MG. Accessory renal vessels. Acta Inform Med 2012;20:196-7. 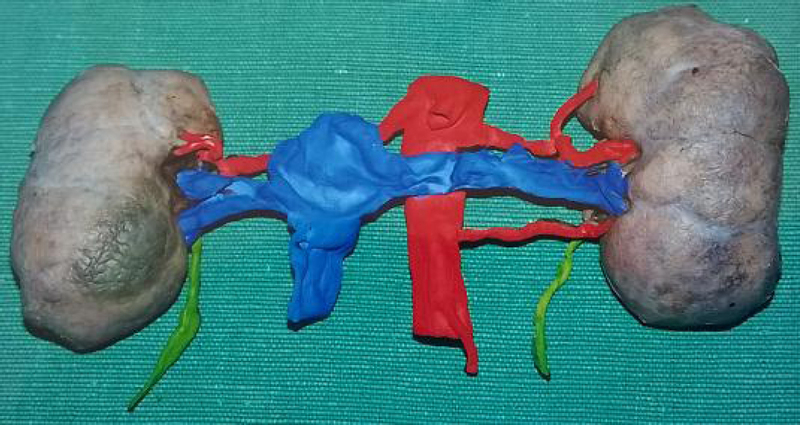 Bordei P, Sapte E, Iliescu D. Double renal arteries originating from the aorta. Surg Radiol Anat 2004;26:474-9. Mir NS, Ul Hassan A, Rangrez R, et al. Bilateral duplication of renal vessels: Anatomical, medical and surgical perspective. Int J Health Sci (Qassim) 2008;2:179-85. Pestemalci T, Mavi A, Yildiz YZ, Yildirim M,Gumusburun E. Bilateral triple renal arteries. Saudi J Kidney Dis Transpl 2009;20:468-70. Anson BJ, Richardson GA, Minear WL.Variations in the number and arrangement of renal vessels- a study of blood supply of four hundred kidneys. J Urol 1936;36:211. Reis RH, Esenther G. Variations in the pattern of renal vessels and their relation to the type of posterior vena cava in man. Am J Anat 1959; 104:295-318. Carson WJ. Anomalous renal vessels and their surgical significance. West J Surg Gynecol Obstet 1932;40:597. Adachi B. Das Arteriensystem der Japaner II. Kyoto, Tokyo: Maruzen Publishing Co.; 1928. p. 73-8. Sykes D. The arterial supply of the human kidney with special reference to accessory renal arteries. Br J Surg 1963;50:368-74. Geyer JR, Poutasse EF, Cleveland MD. Incidence of multiple renal arteries on aortography. J Am Med Assoc 1962;182:120-5. Olsson CA. Campbell’s Urology. 5thed., Vol. I. Philadelphia: W.B. Saunders Co.; 1986. p. 311.